From 15 feet away and more this looked like Starbucks, but no, it wasn’t. Not even close. I travel with my own coffee, and Senor Muggy, but when needed I’ve found that Starbucks works. Zeldman told me that once. He said Starbucks was a trusted, known source, of mediocre coffee – consistently mediocre. I was like whatever, but that’s totally true in Taiwan. 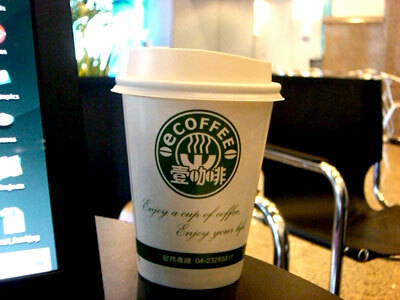 While the Taiwanese do buffets right, corporate coffee is bad just like everywhere else. In Taipei, they also have a thing for outlets with funny names. A comment and revised sentence above clarifying that Taipei’s corporate-chain coffee was bad, just like anywhere else (v. Starbucks that’s mediocre everywhere). We did have good coffee in a stand during our ride.